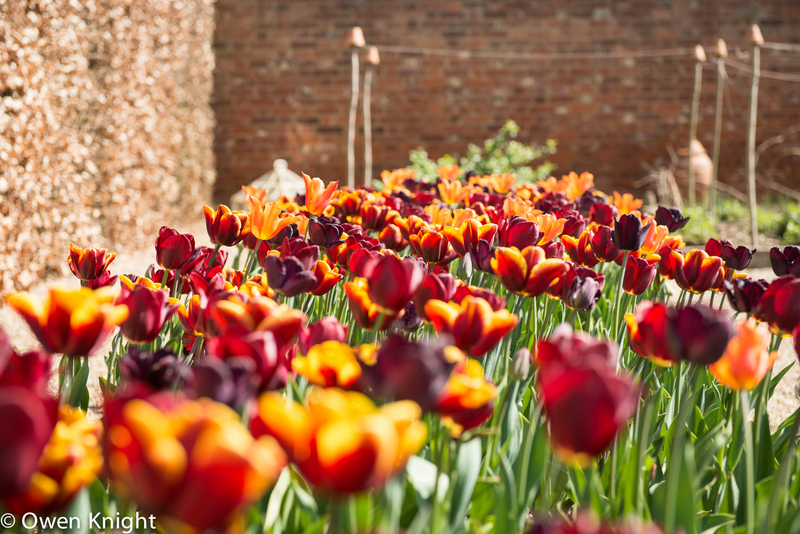 Last weekend I visited the Open Day at Ulting Wick, near Maldon, Essex, as part of the National Gardens Scheme, Some nine thousand tulips and other spring plants were in bloom in the warm sunshine. 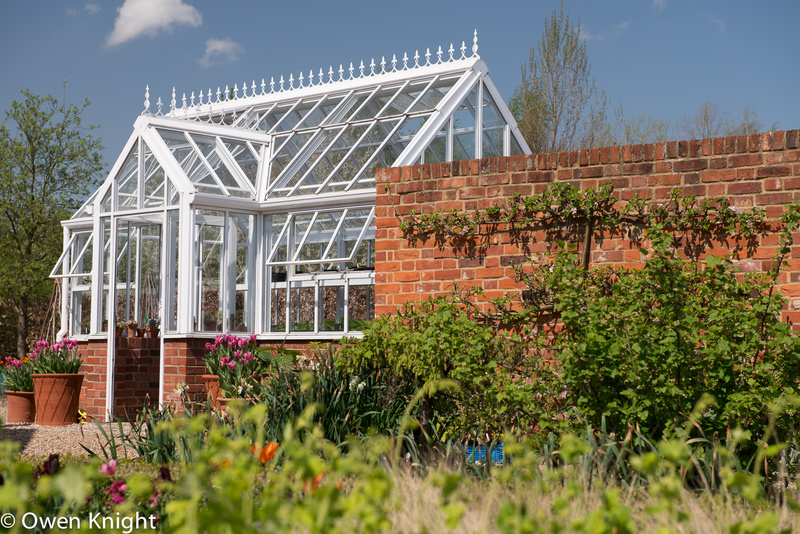 I do enjoy the sight of a traditional brick-built greenhouse, whatever the size. 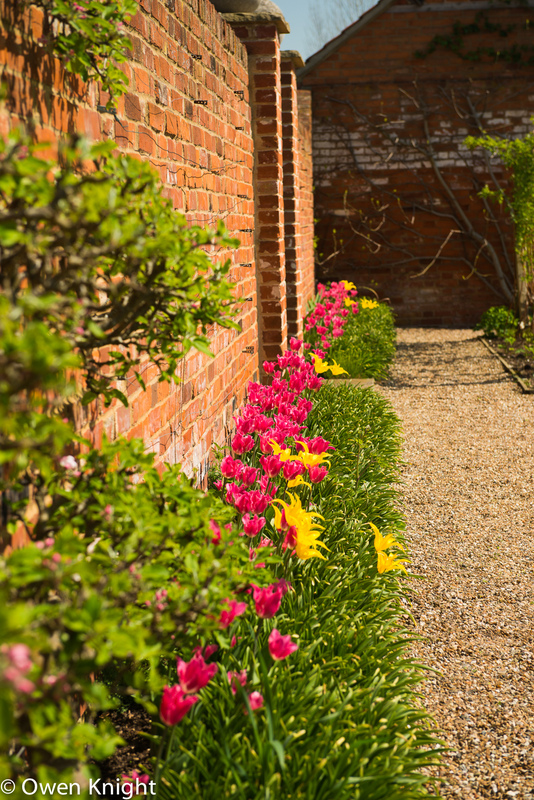 The main focus of the trip was of course, the spring bulbs, beautifully offset against the black wooden barns. You do not need to know the names of the individual varieties to enjoy them. These were thriving against a south-facing wall. 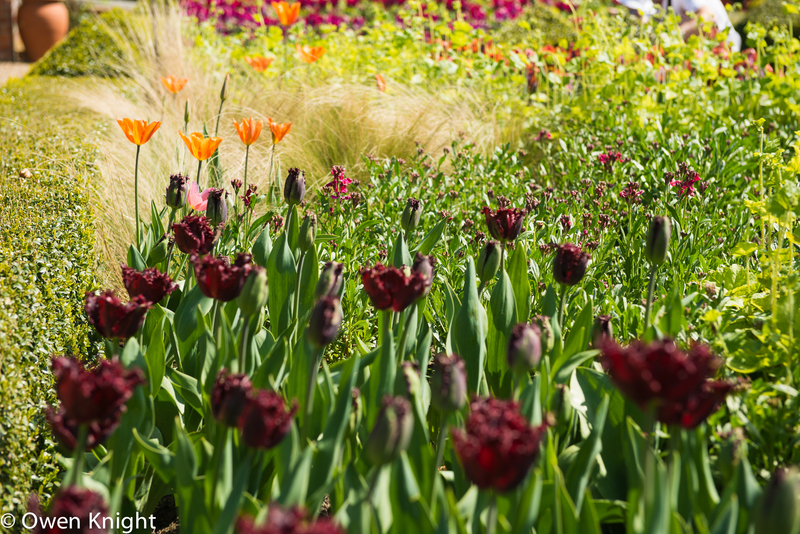 Whereas the dense plantings of mixed colours offset each other with interesting contrasts of colours. 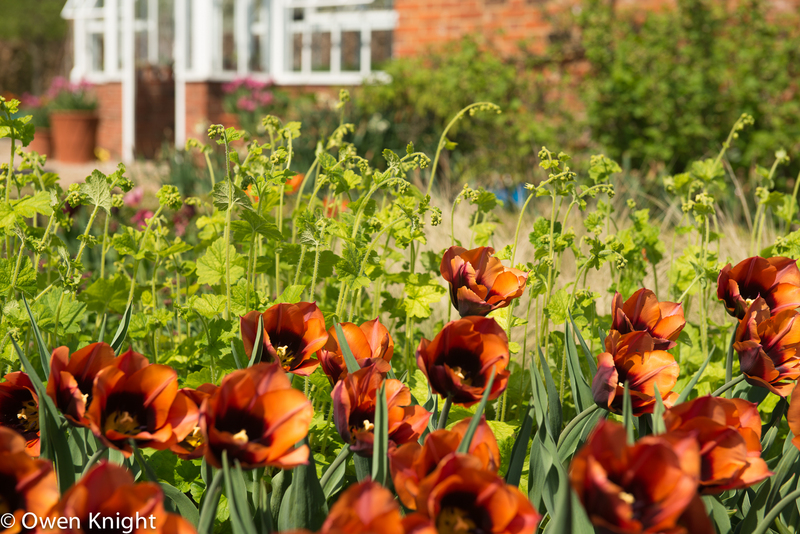 Whereas these, with their distinct deep orange-brown blooms were to be admired as a discrete group. 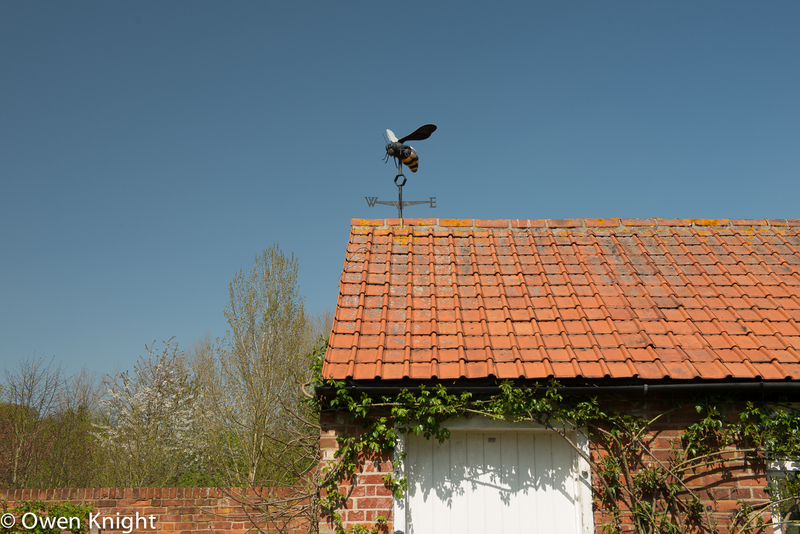 This is one of the most unusual weather vanes I have come across, with the bee facing into the warm south-westerly breeze. 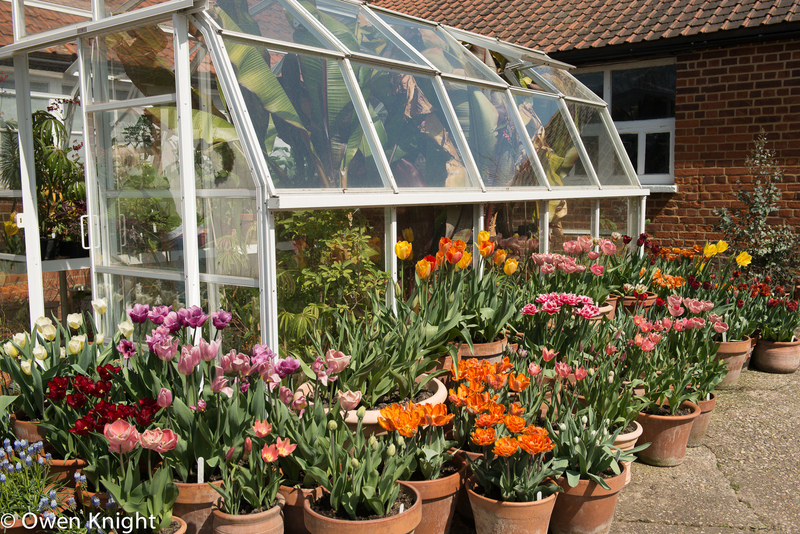 A more modern greenhouse sheltered banana plants and was surrounded by more varieties of tulips, making an attractive display. 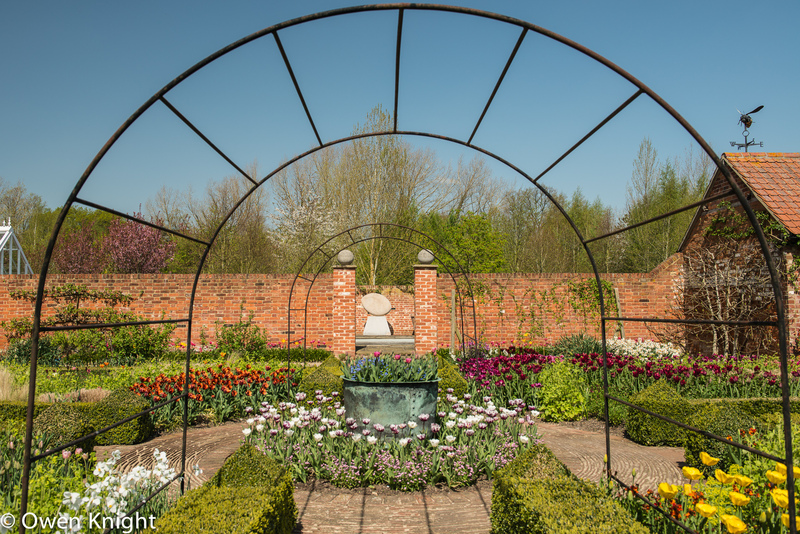 …while the centrepiece of a pergola leading to a filled large copper pot dominated the central area. I was told by one of the staff that there are is only one full-time gardener, in addition to the owner, for the eight acres. Apparently, as a rule of thumb, one gardener should be able to manage five acres. The reds and yellows glow brightly against the black backdrop. 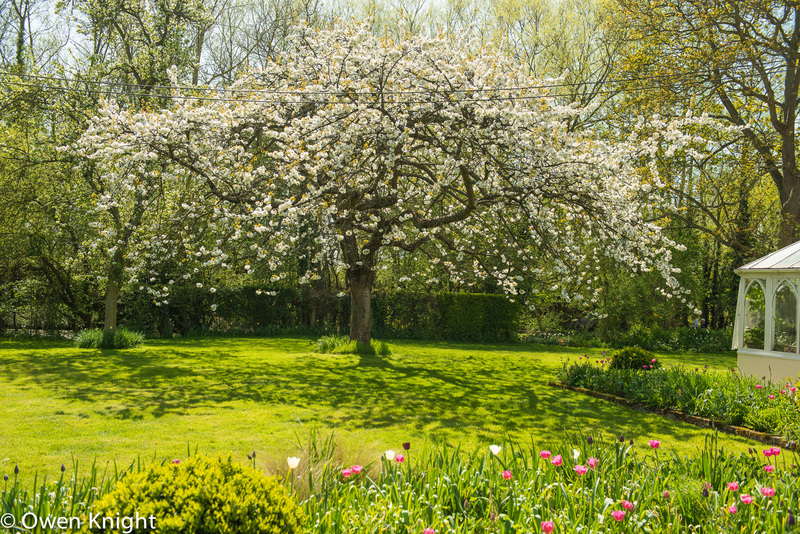 To the side of the house, a cherry tree in full blossom i surrounded by a naturalistic planting of lighter shades. 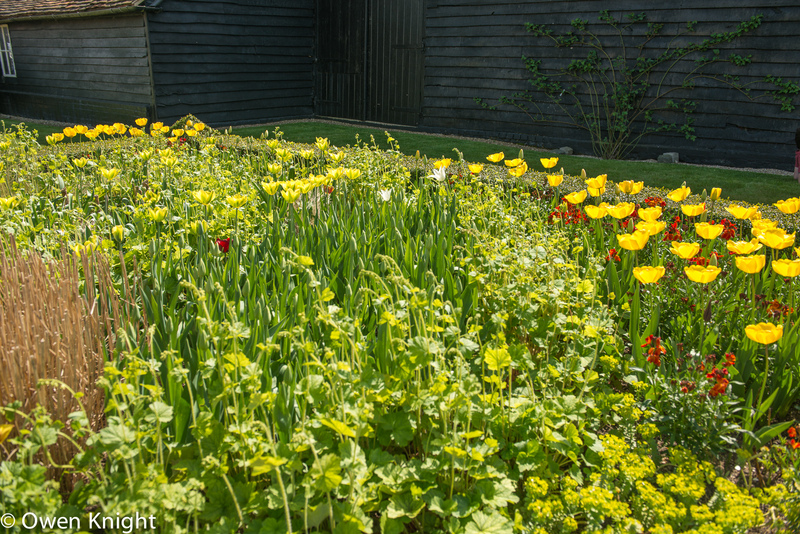 This garden is well worth visiting and can be combined with a short walk to the riverside church of All Saints, Ulting. Owen and for visiting the garden. Thank you for your kind comments in the blog. Just a couple of corrections for you. 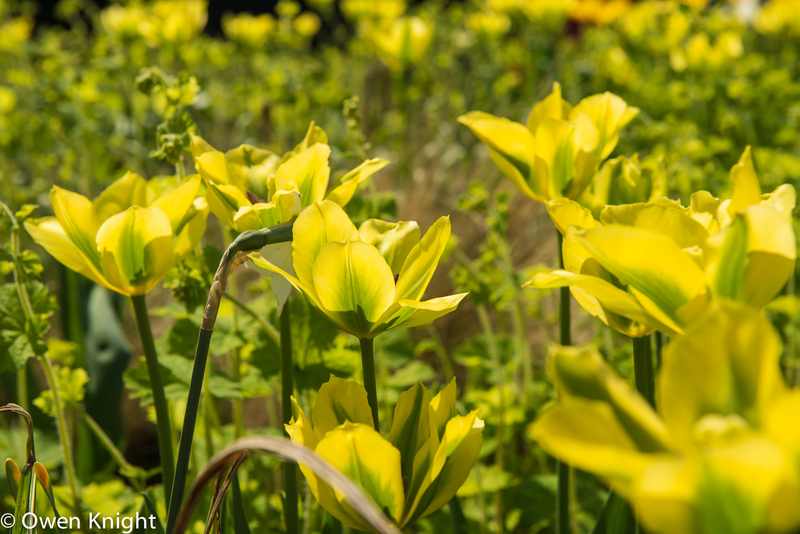 There is one full time gardener here and a very enthusiastic owner (me) who often gardens from 8 am to 7pm – I rarely have a day when I am not in the garden. There is a one part time gardener who does 2 days week. We have no volunteers. The pots around the Hartley Botanic Greenhouse are not moved into the garden. They are just for display plus somewhere I can trial new varieties sent to me by Peter Nyssen. 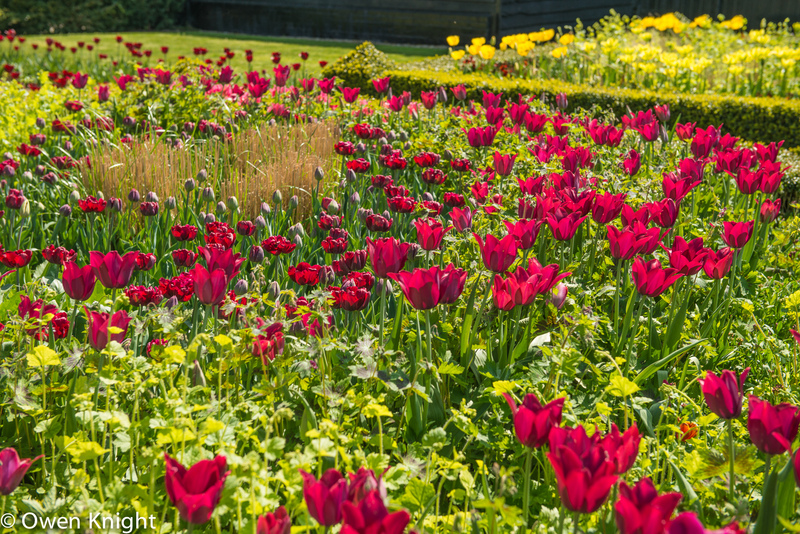 We planted 10,000 tulips last year and added to many already in the garden. 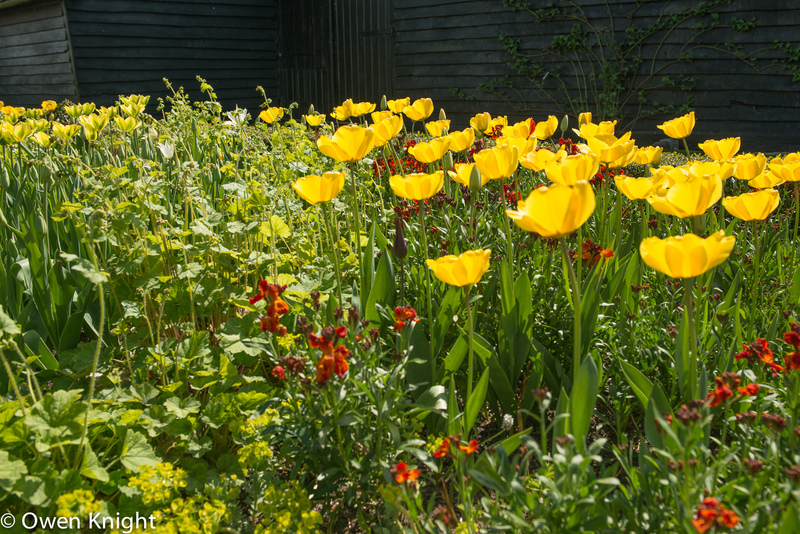 Thank you for your support of the NGS charities and I look forward to welcoming you to the garden another time. The summer displays are very different!